Olympia Auto Mall - Washington's Largest Selection of New and Used Cars: 2016 Jeep Wrangler – Your Off Road Experience Just Got Better! 2016 Jeep Wrangler – Your Off Road Experience Just Got Better! Jeep owners are a separate breed. We don't wait for a nice sunny day to go exploring new territory. Rain, sleet, or snow does not keep us from our destination. The 2016 Jeep Wrangler is up to the challenge. The exterior features a bit more of a classy appearance with the emphasis on reducing vibration and noise during off- road driving. The windshield is fixed rather than fold-down to assist in the effort. However, the classic Jeep toughness is still intact. Interior design also has more of a luxurious appearance than in previous years. The controls are placed within easy reach. The last thing I want to worry about during trail driving is reaching for knobs and buttons located distantly on the dashboard. 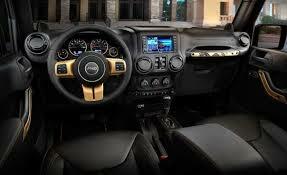 Jeep has minimized this concern with the upgraded interior. Included is a military grade navigation system and top notch entertainment system for an even more enjoyable trip. Plenty of power is provided by the 285 horsepower 3.6 liter V6 engine. If you are like me, the 6 speed manual transmission gives you a greater feeling of control, but a 6 speed automatic is also available. Four-wheel drive is standard as you would expect. This Jeep strives to make the road trip just as pleasurable as the off-road experience. If you are new to Jeep, you will want to test drive this capable SUV before making any buying decision. Current Jeep owners may want to consider upgrading in 2016 after taking a good look at the Wrangler.